The fall of Lucifer with his demons from Mount Calvary to the depths of hell, was more turbulent and furious than when he was thrown from heaven. And although that place is always a dark land covered in the shadows of death, of a caliginous (dark) confusion, of miseries, torments and disorder, as Saint Job says, on this occasion his unhappiness and disturbance was greater, because the condemned souls received new horror and accidental grief with the ferocity of the demons that descended. 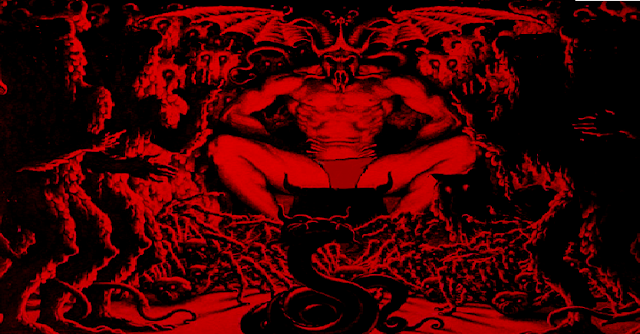 It is true that they have no power in hell to put souls at will in places of greater or lesser torment; because this is decided by the divine justice, according to the demerits of each of the condemned. But, in addition to the essential penalty, the Judge orders other accidental penalties on some occasions; because their sins left in the world roots and many damages for others that for their cause are condemned, and the new effect of their sins causes them these penalties. The demons tormented Judas with new penalties, for having sold and procured death to Christ. And they knew that this place of such formidable sorrows, where they had placed him, was destined for the punishment of those who only had faith without works, and those who scorned the cult of this virtue and the fruit of human redemption. And against these demons manifest the greatest indignation, as they conceived it against Jesus and Mary. As soon as Lucifer was permitted to proceed in these matters and arise from the consternation in which he remained for some time, he set about proposing to his fellow-demons new plans of his pride. For this purpose he called them all together and placing himself in an elevated position, he spoke to them: "To you, who have for so many ages followed and still follow my standards for the vengeance of my wrongs, is known the injury which I have now sustained at the hands of this Mangod, and how for thirty-three years He has led me about in deceit, hiding his Divinity and concealing the operations of his soul, and how He has now triumphed over us by the very Death which we have brought upon Him. Before He assumed flesh I hated Him and refused to acknowledge Him as being more worthy than I to be adored by the rest of creation. Although on account of this resistance I was cast out from heaven with you and was degraded to this abominable condition so unworthy of my greatness and former beauty, I am even more tormented to see myself thus vanquished and oppressed by this Man and by his Mother. From the day on which the first man was created I have sleeplessly sought to find Them and destroy Them; or if I should not be able to destroy Them, I at least wished to bring destruction upon all his creatures and induce them not to acknowledge Him as their God, and that none of them should ever draw any benefit from his works. This has been my intent, to this all my solicitude and efforts were directed. But in vain, since He has overcome me by his humility and poverty, crushed me by his patience, and at last has despoiled me of the sovereignty of the world by his Passion and frightful Death. This causes me such an excruciating pain, that, even if I succeeded in hurling Him from the right hand of his Father, where He sits triumphant, and if I should draw all the souls redeemed down into this hell, my wrath would not be satiated or my fury placated." Is it possible that the human nature, so inferior to my own, shall be exalted above all the creatures! That it should be so loved and favored, as to be united to the Creator in the person of the eternal Word! That He should first make war upon me before executing this work, and afterwards overwhelm me with such confusion! From the beginning I have held this humanity as my greatest enemy; it has always filled me with intolerable abhorrence. O men, so favored and gifted by your God whom I abhor, and so ardently loved by Him! How shall I hinder your good fortune? How shall I bring upon you my unhappiness, since I cannot destroy the existence you have received? What shall we now begin, O my followers? How shall we restore our reign? How shall we recover our power over men? How shall we overcome them? For if men from now on shall not be most senseless and ungrateful, if they are not worse disposed than we ourselves toward this Godman, who has redeemed them with so much love, it is clear that all of them will eagerly follow Him; none will take notice of our deceits; they will abhor the honors which we insidiously offer them, and will love contempt; they will seek the mortification of the flesh and will discover the danger of carnal pleasure and ease; they will despise riches and treasures, and love the poverty so much honored by their Master; and all that we can offer to their appetites they will abhor in imitation of their true Redeemer. Thus will our reign be destroyed, since no one will be added to our number in this place of confusion and torments; all will reach the happiness which we have lost, all will humiliate themselves to the dust and suffer with patience; and my wrath and haughtiness will avail me nothing." "Ah, woe is me, what torment does this mistake cause me! When I tempted Him in the desert, the only result was to afford him a chance to leave the example of this victory, by following which men can overcome so much the more easily. My persecutions only brought out more clearly his doctrine of humility and patience. In persuading Judas to betray Him, and the Jews subject Him to the deadly torture of the Cross, I merely hastened my ruin and the salvation of men, while the doctrine I sought to blot out was only the more firmly implanted. How could One who is God humiliate Himself to such an extent? How could He bear so much from men who are evil? How could I myself have been led to assist so much in making this salvation so copious and wonderful? O how godlike is the power of that Man which could torment and weaken me so? And can this Woman, his Mother and my Enemy, be so mighty and invincible in her opposition to me? New is such power in a mere creature, and no doubt She derived it from the divine Word, whom She clothed in human flesh. Through this Woman the Almighty has ceaselessly waged war against me, though I have hated Her in my pride from the moment I recognized Her in her image or heavenly sign. But if my proud indignation is not to be assuaged, I benefit nothing by my perpetual war against this Redeemer, against his Mother and against men. Now then, ye demons who follow me, now is the time to give way to our wrath against God. Come all of ye to take counsel what we are to do; for I desire to hear your opinions." Some of the principal demons gave their answers to this dreadful proposal, encouraging Lucifer by suggesting diverse schemes for hindering the fruit of the Redemption among men. They all agreed that it was not possible to injure the person of Christ, to diminish the immense value of his merits, to destroy the efficacy of the Sacraments, to falsify or abolish the doctrine which Christ had preached; yet they resolved that, in accordance with the new order of assistance and favor established by God for the salvation of men, they should now seek new ways of hindering and preventing the work of God by much the greater deceits and temptations. In reference to these plans some of the astute and malicious demons said "It is true, that men now have at their disposal a new and very powerful doctrine and law, new and efficacious Sacraments, a new Model and Instructor of virtues, a powerful Intercessor and Advocate in this Woman; yet the natural inclinations and passions of the flesh remain just the same, and the sensible and delectable creatures have not changed their nature. Let us then, making use of this situation with increased astuteness, foil as far as in us lies the effects of what this Godman has wrought for men. Let us begin strenuous warfare against mankind by suggesting new attractions, exciting them to follow their passions in forgetfulness of all else. Thus men, being taken up with these dangerous things, cannot attend to the contrary." Acting upon this counsel they redistributed the spheres of work among themselves, in order that each squadron of demons might, with a specialized astuteness tempt men to different vices. They resolved to continue to propagate idolatry in the world, so that men might not come to the knowledge of the true God and the Redemption. Wherever idolatry would fail, they concluded to establish sects and heresies, for which they would select the most perverse and depraved of the human race as leaders and teachers of error. Then and there was concocted among these malignant spirits the sect of Mahomet, the heresies of Arius, Pelagius, Nestorius, and whatever other heresies have been started in the world from the first ages of the Church until now, together with those which they have in readiness, but which it is neither necessary nor proper to mention here. Lucifer showed himself content with these infernal counsels as being opposed to divine truth and destructive of the very foundation of man's rescue, namely divine faith. He lavished flattering praise and high offices upon those demons, who showed themselves willing and who undertook to find the impious originators of these errors. Some of the devils charged themselves with perverting the inclinations of children at their conception and birth; others to induce parents to be negligent in the education and instruction of their children, either through an inordinate love or aversion, and to cause a hatred of parents among the children. Some offered to create hatred between husbands and wives, to place them in the way of adultery, or to think little of the fidelity promised to their conjugal partners. All agreed to sow among men the seeds of discord, hatred and vengeance, proud and sensual thoughts, desire of riches or honors, and by suggesting sophistical reasons against all the virtues Christ has taught; above all they intended to weaken the remembrance of his Passion and Death, of the means of salvation, and of the eternal pains of hell. By these means the demons hoped to burden all the powers and the faculties of men with solicitude for earthly affairs and sensual pleasures, leaving them little time for spiritual thoughts and their own salvation. It is not possible to rehearse all the schemes of this dragon and his allies concocted at that time against the holy Church and her children, in order that these waters of Jordan might be swallowed up in his throat. It is enough to state that they spent nearly a full year after the Death of Christ conferring and considering among themselves the state of the world up to that time and the changes wrought by Christ our God and Master through his Death and after having manifested the light of his faith by so many miracles, blessings and examples of holy men. If all these labors have not sufficed to draw all men to the way of salvation, it can be easily understood, that Lucifer should have prevailed and that his wrath should be so great, as to cause us justly to say with saint John: "Woe to the earth, for satan is come down to you full of wrath and fury!'' But alas! that truths so infallible and so much to be dreaded and avoided by men, should in our days be blotted from the minds of mortals to the irreparable danger of the whole world! Our enemy is astute, cruel and watchful: we sleepy, lukewarm and careless! What wonder that Lucifer has intrenched himself so firmly in the world, when so many listen to him, accept and follow his deceits, so few resist him, and entirely forget the eternal death, which he so furiously and maliciously seeks to draw upon them? I beseech those, who read this, not to forget this dreadful danger. If they are not convinced of this danger through the evil condition of the world and through the evils each one experiences himself, let them at least learn this danger by the vast and powerful remedies and helps, which the Savior thought it necessary to leave behind in his Church. For He would not have provided such antidotes if our ailment and danger of eternal death were not so great and formidable. “MYSTICAL CITY OF GOD”. YEAR 1888.